As a woman enters a blind alley late at night, she finds herself cornered by a gang of thugs. Meanwhile, a narrator considers that New York is called “the Big Apple” because it’s as tempting as the first apple… but not because it’s green. As the thugs take the woman’s purse, the narrator says New York isn’t green like the color of money, either. The thugs move in with a knife only to be struck with shuriken. The narrator turns out to be Donatello, who thinks that New York isn’t green like the “blood that sometimes runs”, either. Don takes out the last of the thugs with his staff, returns the purse to the lady and disappears up a fire escape. Reuniting with his brothers on the roof, he considers that green can also be the color of one’s skin and the color of hope, too. *Both author and artist for “Green” are natives of Germany. Schaaff has previously worked on the German version of MAD Magazine while Liehr has written for LucasFilm/Decipher. I sometimes wonder how much of this piece was lost in the translation from German to English. I ponder this because Donatello’s inner monologue seems only semi-coherent. He starts thinking that New York isn’t “green” even though it’s called “the Big Apple” (I usually think of red when I think of apples, but I’ll concede the point). Then he goes on to list other things that are green, which New York is not like: money and… blood? I guess he means his blood? Do the TMNT bleed green? Finally he caps it off by turning around and listing more things that are green, but this time they’re things that are positive qualities? Like skin color and hope? The end result reads very sloppy; an almost stream of consciousness pile of nonsense that seems translated on the fly, or at least written by someone without the firmest grasp of the English language. It yearns to be “profound”, but is much too confused in its phrasing and message. Schaaff, as I understand it, draws for the German version of MAD Magazine and his style used in "Green" definitely reflects that occupation. It’s certainly readable, but the anatomy looks like someone used to drawing in the abstract, squash-and-stretch MAD Magazine style trying to reign it in to typical comic book art. Not "Hedden and McWeeney" or "Mark Martin" levels of surreal craziness, but somewhere in-between that and action-adventure stuff. Your mileage may vary. 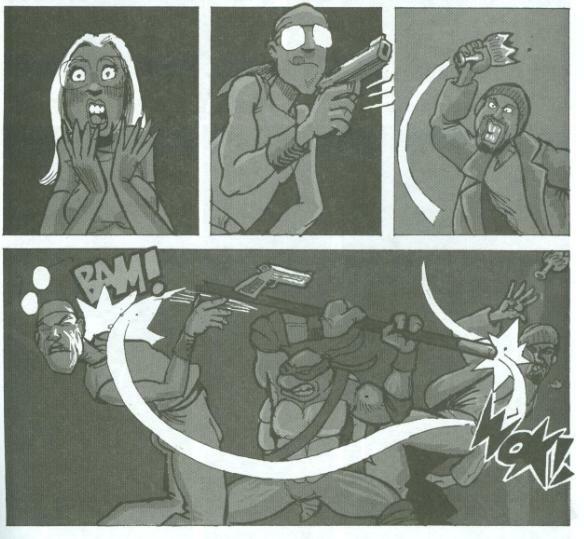 “Green” isn’t one of the better back-up strips in TMNT’s comic book history, all things considered. The adventure presented in it is entirely mundane, with the meat of the story hinging on its “profound” inner monologue. But when that profound inner monologue scarcely makes a lick of sense, the whole thing is just a bust. It's been a long time since I've given this short some thought. I had completely forgotten Tales V2.3 even had a back-up story. i met on of them when they were in london! I got two pics when one of the guys was in london ...shame i reduced the size of the image so much when i posted them in my site.